McAfee delivers a well priced package with above average detection rates. McAfee's packages include options for built in PC optimization tools, parental controls, email spam blocking, hacker and thief firewall protection and social media link protection for unlimited devices. McAfee is one of the most well-known antivirus providers, and for good reason. Whether you need virus protection for home or for your business, there are several options available. Although the real time protection and performance come in at an average rating, many users may find the easy to use interface, excellent customer support and money back guarantee enough to curb those concerns. McAfee AntiVirus - Includes full antivirus protection with free 24/7 support and built in PC optimization tools for a single device. McAfee Internet Security - Includes full antivirus protection with free 24/7 support, built in PC optimization tools, parental controls and e-mail and spam blocking for unlimited devices. McAfee Total Protection - Includes full antivirus protection with free 24/7 support, built in PC optimization tools, parental controls, email spam blocking, hacker and thief firewall protection and social media link protection for unlimited devices. Protect private files with encryption software and safely store your passwords with the True Key app. McAfee Antivirus software is probably the easiest antivirus packages in the market to use. The simplicity of the primary dashboard ensures users know the current state of its operating system protection. Performing both quick and full scans is only a few clicks away, and it’s easy to set up auto scans. This antivirus has all features enabled and pre-configured instantly after installation, without the need for a reboot. Although many antivirus products have a somewhat sketchy past, the current generation of software delivers. When comparing reliability, most antivirus packages need to hold their own in two primary areas of antivirus protection: virus detection through traditional virus scanning and real-time protection as files are saved to the system. According to AV-Comparatives, a prominent 3rd-party virus testing company, all McAfee antivirus packages are in the top tier for traditional virus file detection. And while not as strong for real-time scanning protection, McAfee still came back with an average score. 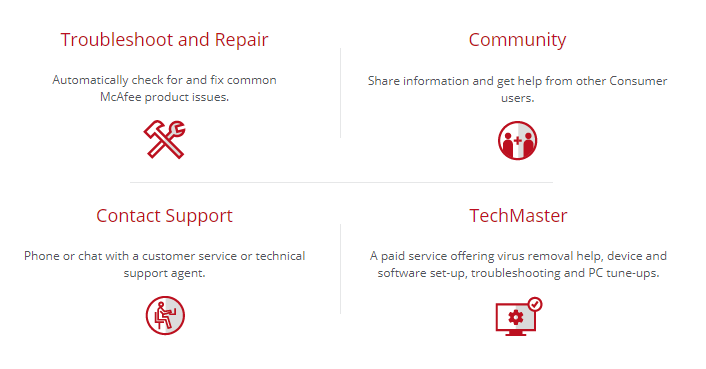 McAfee provides customers with extensive support options, including their Antivirus support website completely dedicated to frequently asked questions and an online knowledge base. Depending on their comfort level, users can use the online chat system, make a phone call or even purchase various support packages. It's important to note that McAfee products tend to use more resources than other antivirus products, which can result in some performance loss on the system. Many users will find that most antivirus software packages that are simple to use tend to use more resources than others. If you are worried about a slow device, changing the settings in your antivirus package can help, as well a free virus scans that are offered on the McAfee website. McAfee is one of the biggest and most trusted names in antivirus software. McAfee provides secure total protection for your computer and devices. No matter which package you choose you will have access to free 24/7 support, parental controls and a 30-day money-back guarantee. When you spend a little more for the internet security and total protection packages, you get anti-malware, anti-theft and file protection for any Mac, Windows or Android device. You can also opt for parental controls, anti-spam to block dangerous emails and the True Key app to store your passwords and usernames. Since 1987, McAfee has been creating antivirus and computer security products. As one of the original pioneers of the antivirus market, antivirus packages such as McAfee Antivirus Plus, McAfee Internet Security and McAfee Total Protection are often packaged with pre-built computer systems from companies such as Dell, Acer and Lenovo. Today, McAfee Corporation is owned by Intel Corporation and updates their security software packages at their security center in Santa Clara, California.